1989: The documentary video ''Jouen - The world of Minomura Kou'' was made by [[Syoichi Yoshimura]]. Directed by [[Haruki Yukimura]]. [[Chimuo Nureki]], [[Oniroku Dan]], [[Tetsuro Sakuragi]], [[Go Arisue]], [[Yoji Muku]] and [[Syoichi Yoshimura]] appeared on the video. 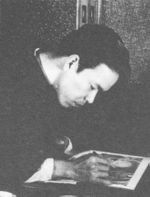 1950: The name "Reiko Kita" began to appear on Suma's work[Citation needed].